The ninth largest municipality in Massachusetts and the largest city in Essex County is the delightful City of Lynn. This beautiful coastal city is just nine miles north of Boston on the Atlantic Coast and is an important part of Greater Boston’s urban inner core. Lynn is known for its diverse population, cultured downtown, beautiful open spaces and public parks, and historic architecture, among other things. Providing year-round services and programming, the Lynn Parks and Recreation Department is more than seventy-five years old. 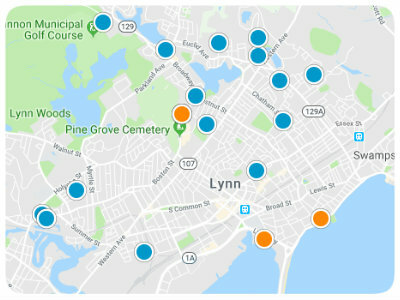 It is a division of the Lynn Department of Public Works and is continuously striving to provide Lynn residents with a high quality of life by offering entertainment outings, sports clinics, park programs, and recreational activities. The Parks Department operates several programs throughout the summer at ten of its neighborhood playgrounds and parks. Those ten parks include Clark Street Playground at the end of Clark Street, Marian Gardens Park on Anderson Way, Gallagher Playground on Ontario, Gowdy Park on Cedarbrook Road, and Barry Park on Boston Street. Other parks in Lynn include Magnolia Park on Magnolia Avenue, Flax Pond Playground on Chestnut Street, Lynn Woods Playground on Great Falls Road, Kiley Playground on Sanderson Avenue, and Keaney Park on Memorial Park Avenue. Summer programs are offered to all children regardless of social or economic circumstance and include baseball, kickball, basketball, softball, dodgeball, flag football, tennis, ski program, swim program, and bowling league. In addition to these athletic programs they also provide movie nights, roller skating outings, bike safety training, cake decorating, miniature golf, arts and crafts, sand castle building contests and field trips. For example, field trips in 2017 included destinations like Legoland, Laser Craze, and the Aquarium, while the Arts and Crafts schedule included activities like puffy paint, tie-dye art, Fruit Loop jewelry, and a coloring contest. During the summer months, the Lynn Parks and Recreation Department also hosts a Special Needs Camp which runs Monday through Friday for five weeks. Other programs include Bowling League, Fall and Spring Tennis, Winter Snowboarding and Skiing, Winter Softball, Baseball and Swimming, and an Afterschool Program. Jurisdiction of Lynn Woods Reservation is shared with the Lynn Park Commission. Lynn Woods encompasses nearly one-fifth of the city and is a beautiful space rich with recreational opportunities. The Park Commission also helps community gardens on city-owned parkland that is maintained by residents. Providing such a long list of exceptional services, the Lynn Parks and Recreation Department is a great reason to buy a home in Lynn, Massachusetts.